Different monitors tend to display colour differently. This is because the colour calibration of monitors generally differs to a varying degree. To ensure that colours are being displayed accurately, at least with the constraints of the colour space, a monitor needs to be correctly calibrated. Many monitors off the shelf are only roughly calibrated at best. To illustrate this consider the picture below. The bottom left of the screen grab has been calibrated, while the top right is not. The un-calibrated screen is decidedly blue, so any work completed on this monitor would end up looking yellow as the artist removed the apparent blueness form the image. Many software packages have calibration modules which help the user work with the colour settings on the monitor to calibrate it correctly. 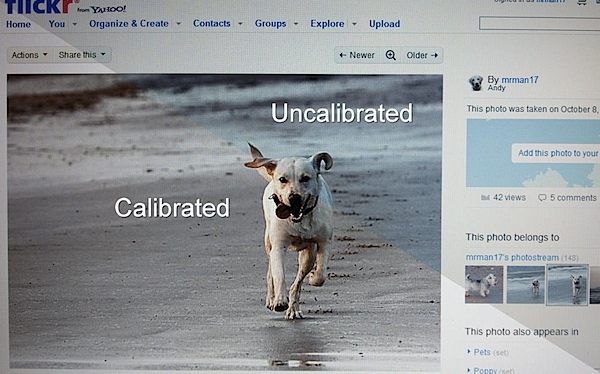 For accurate calibration, however, a hardware device is used. These USB devices look like a mouse. They are moved over the screen and the accompanying software configures the screen to show true colour.